One of the beauties of direct mail is that it allows you to send people just about anything you can print. Your creative options are virtually endless. And while the standard envelope package is usually considered the most effective, there are plenty of other formats you can test. Reduce costs with a self-mailer. It offers low cost and a quick read, good for quickly recognized content. It also helps speed response because it’s not as in-depth as a full package and looks more urgent and newsy. To make a self-mailer work at peak efficiency, combine elements of a standard direct mail package and a print ad. Include a strong headline in bold type, copy in easy-to-read sections, strong visuals, clear offer, reply card, toll-free number, message or mini-letter printed near the recipient’s address, feature list, testimonials, guarantee, and other elements as needed. Signal exclusivity with an invitation. To make an offer special, you can issue an invitation in the appropriate format, usually a smaller envelope and letter on high-quality paper. This works best for offers targeted to high-income prospects, professionals, and executive level positions; for events such as conferences, meetings, and presentations; or for offers that need a quality feel. Add urgency with a telegram. This is a good idea that is, unfortunately, wildly overused. It can be little more than an envelope design, such as “Urgent Gram,” “Speed Gram,” or some variation. Or it might be an envelope and letter combo resembling an actual telegram printed on yellow paper with tractor-feed holes down the sides of the letter. One way to make this format work is to create your own urgent-looking envelope for fulfillment materials. This allows the envelope to get noticed and assures that the contents will be relevant and interesting instead of boilerplate. Create an official look with a snap-pack. This format is often used for official notices or statements, so it gives your ad message the same feel. And because the recipient has to rip open the edge of the envelope and pull out the contents, it creates involvement. It’s good for generating inquiries or for organizations with recognizable and trusted names. It has been used with particular success in the nonprofit sector to deliver what appears to be an urgent, cheap appeal for funds. Generate quick leads with a postcard. Direct sales are possible with postcards but only for simple offers, such as magazine subscriptions. They are much better for building traffic for local retail or for generating inquiries for familiar services, such as real estate or carpet cleaning. However, because response is so easy, lead quality is often low. But it’s worth testing. Just remember to telegraph your message with a clear benefit headline, strong and tangible offer, a picture of what you’re offering, lean copy, and a bold call to action. Use dimensional mailings cautiously. Boxes, bags, tubes, folders, and other unusual formats are great for getting attention. But while there are plenty of examples of successful campaigns, these formats are usually misused, wasting money on a novel format when a standard format could deliver a more powerful message and net a greater response or profit. Most of the dimensional mailings I have seen are simply a way for ad agencies to jack up their fee and cover up the fact that they don’t have anything to say about a product or service. When in doubt, use an envelope package. The classic direct mail package consists of an outer envelope (usually #10, 6”x9”, or 9”x12”), a letter, brochure, reply card or order form, maybe one or more inserts, and a reply envelope. The reason this format is a standard is that it has been developed, tested, and perfected over many years. And it works. Test other formats but don’t be different just to be different. Test formats head-to-head. The important point in format testing is to keep the offer, copy, graphics, and all creative elements as similar as possible so that you are testing the format itself and not a new creative treatment. And always test a new format in a head-to-head mailing with the old format. Never make a change until you have proven results. Dean Rieck is an internationally respected consultant, copywriter, and designer specializing in direct marketing. He is president of Direct Creative, a full-service creative firm that helps businesses increase sales and generate leads through effective direct response advertising. E-mail: DeanRieck@DirectCreative.com. For free access to direct marketing articles, tips, and tutorials, visit The Learning Center at www.DirectCreative.com. 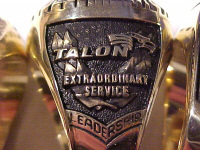 Talon Awards Championship Rings To Employees For Achieving An Important Goal. All professional athletes share one important characteristic - the ultimate reward and satisfaction comes in winning a championship. A very gratifying aspect of the championship is being awarded a Championship ring. 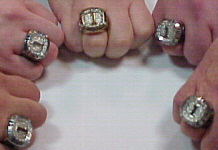 Championship rings have been around for over fifty years. During the last twenty years the trend in professional sports has been larger and more magnificent rings. 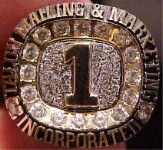 Players, broadcasters and fans often refer to winning championships as getting "the ring". Yankee shortstop Derrick Jeter has four rings. Legendary quarterbacks Joe Montana and Terry Bradshaw also have four. Dan Marino broke almost every passing record in football but would trade all the records for a championship and a ring. I came to the realization a long time ago that Talon Mailing & Marketing would never be the biggest company in the direct marketing industry. However, there was never a doubt in my mind that my staff and I could become the Best Service Bureau in our industry. Realizing this was an attainable and important goal, we set our course on becoming the best service provider in the industry. Pictured above: Twenty Eight testimonial letters proudly displayed at Talon. For the last few years I have felt and continue to feel that we have obtained our goal. Determining that our goal was successfully achieved is not as cut and dry as a team winning a championship game. Here are some reasons I feel we have reached our goal. We receive testimonial letters (without requesting them). Twenty eight of them are on display in our lobby and conference room. Rush mailings are accommodated by quickly scheduling our dedicated staff to run overnight and weekends. We process mailing list selections for list rentals in minutes while other companies need hours or longer. We can perform merge/purges in two days that take other shops two weeks. We answer questions often as soon as they are asked and help our clients save delivery time and postage by recommending more efficient presorts and delivery to local post offices. Including 2003, Talon has experienced ten years of consecutive sales growth. Even during the economic woes of the last two years we have grown sales. So many of our earliest clients are still with us. While client turnover can be high in our industry we continue to service many of our original clients. The employees at Talon deserve a lot of credit. They care about job quality and customer service. Pictured left: Top view of the Talon Ring. Pictured center: One side reads Extraordinary Service and Leadership the other side has Exceptional Talent and dedication. Pictured right: You can see how massive the rings are. I have always admired championship rings. When you see them in person they sparkle and are magnificent. I feel that our achievement is as special as winning a championship and what better way to say thanks to the Talon employees than to have our own one-of-a-kind championship ring. My objective when designing the Talon ring was that it would be the same size and quality of the rings professional athletes wear. Is there anything better than golf on Long Island? There have never been more courses than there are now. There have never been more players. Now, not only does Long Island produce its own excellent players, it attracts the best from all over the world! The Champion’s Tour is also making a stop on Long Island, for the Commerce Bank Long Island Classic at Eisenhower’s Red Course, yet another public course. Name another public course that hosts a notable Champion’s Tour event. I’ll bet you can’t. Or name a place that has hosted a US Open that was as successful as Bethpage Black. That’s impossible. Golfers and businesses on Long Island have benefited in a multitude of ways from the success of Bethpage, Shinnecock, and Eisenhower. First, they get to witness the greatest golfers in the world -- in their own backyards! Second, Long Island receives attention on a national scale, increasing the likelihood of future tournaments returning to Long Island. Third, renovations must be made to each course to make it suitable for championship play. These renovations last long after the tournament is gone, making for a better-crafted and more beautiful golf course. If you don’t believe me, go to Bethpage! Fourth, the revenue generated by hosting these tournaments results in the creation of more jobs, an increased cash flow to the golf course, the Long Island economy and surrounding community, and other courses bettering themselves in order to compete with those that have received all the attention. It is truly a win-win-win situation for golfers and Long Island. I’ve mentioned only three courses on Long Island. In total, there are over 130, meaning you could play a different course every week and not get through them all for almost three years. Each course is special in its own way, and it is easy to find one that suits your game. There is a pretty even split between the amount of public courses and the amount of private courses here, meaning if you prefer an exclusive club or a little taste of everything, you’ll like what Long Island has to offer. Some of the best private clubs include Atlantic, The Creek, Fresh Meadow, Garden City, and Maidstone. Some fine public courses include Bethpage, which has four more courses in addition to the Black, Harbor Links, Montauk Downs, Stonebridge, Tallgrass, Links at Shirley and the newly renovated courses at Timber Point. With the wide range of courses Long Island has to offer, it’s a great time to be a golfer, or a great time to learn golf! Golf is great for your business. Don’t miss out on the best game in the world, in the best place to play it! John Glozek, Jr. is Publisher and Owner of Long Island Golfer Magazine. Please visit their website at www.longislandgofermagaine.com You can contact John at ligolfer@aol.com. The Celebritycafe.com - the longest running entertainment magazine on the internet founded in 1995. Cross Word Puzzle Help - Here is a link when you are stuck with a crossword puzzle, Try it!